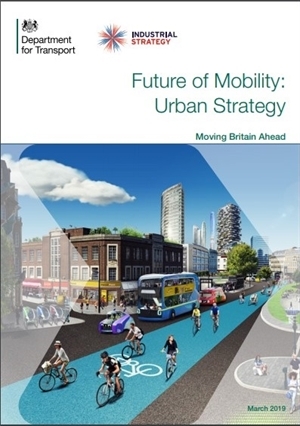 The ‘Future of mobility: urban strategy’ outlines the Government’s approach to maximising the benefits from transport innovation in cities and towns and sets out the principles that will guide Government’s response to emerging transport technologies and business models. The Department for Transport calls the strategy "the biggest regulatory review in a generation". The introduction to the Government's strategy, published in March, says that advances in data science, artificial intelligence and sensing technology have increased the speed of transport innovation. It says that cleaner transport, automation, new business models and new modes of travel promise to transform how people, goods and services move. The strategy calls for a review of regulations around 'new transport', including regulations for new types of vehicles such as e-scooters and bicycle trailers, how sharing data can improve services by reducing congestion, and how journey planning and payment can be made more simple through technology. It also looks at modernising laws from the 1800s that it says are a barrier to innovation. Mobility innovation must help to reduce congestion through more efficient use of limited road space, for example through sharing rides, increasing occupancy or consolidating freight. The marketplace for mobility must be open to stimulate innovation and give the best deal to consumers. Meanwhile, the Government is launching a £90m competition for up to four new ‘Future Mobility Zones’ to test ideas to improve journeys for people across the country. It’s hoped the competition will encourage the use of smartphones and other new communications technology to make travel in towns and cities more convenient, reliable and cheaper. Future of Mobility Minister, Jesse Norman, said: "We are at a potentially pivotal moment for the future of transport, with revolutionary technologies creating huge opportunities for cleaner, cheaper, safer and more reliable journeys. "The automotive industry is responding to perhaps the most significant change since the invention of the car. "Mobility as we know it is evolving, improving people’s day-to-day lives with implications for all of society. Today’s strategy offers important guidance on the objectives and principles underpinning the future of mobility in towns and cities, while giving industry scope to invest and innovate, developing exciting new services." In its response, the Campaign for Better Transport said: “Transport is changing and we welcome this focus on the future of mobility. The Government should remove the barriers that hold back our transport system from becoming more sustainable. Alongside The Future of Mobility Strategy, the Government has also published a response to the Last Mile call for evidence it conducted last summer and has outlined next steps for the E-Cargo Bike Grant.